What happens when a small group of parents, dedicated athletes, decide to expose young runners to the kind of passion and commitment to a sport they love. Well, if they are successful they will have shown by example how hard work, patience and persistence can instill in these 10 to 13-year-olds a will to try hard, be part of team and discover the rewards of achievement, all the while having fun along the way. 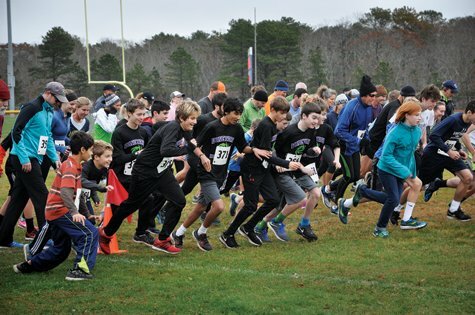 That team is known as the Martha’s Vineyard Cat 5 Hurricanes Youth Running Club–all Island middle schoolers (grades 5-8) who’ve bought into the challenge, and enjoy the competition and its dividends it provides. Last year, the Hurricanes consisted of the two coaches and a group of 4 kids wearing cast off high school track pinnies who attended two meets. This year, the club has grown to 22 kids, who participated participated in over 7 5Ks, a five mile, a 10K and 4 off island meets. A seasonal resident and committed runner donated custom uniforms to outfit the entire team. This past summer they ran the Cape Cod Marathon as a relay team where 5 of their elite runners ran 3 to 6 mile legs of the daunting 26 mile competition finishing 15th in a field of 96. Some of their former members have gone on to MVRHS where they train and compete on the Cross Country Team. Arguably one of the Hurricanes best runners is12 year old Zachary Utz who placed 17th in a field of 450 competing in the State Cross Country Championships held this past Fall in Devens, MA.